​A beautiful capture of a much loved and much missed Boxer named Poppy. This reference image is one of those rare photographs where I only need to work from just 1 photo as there was very little adapting required except to lighten the face up which would balance the portrait out and remove the blue cast on the white areas. There was little I needed to adapt on the photographic reference as the owner had captured a little gem amongst photo's, however I decided to lighten up the face a little more due to the sun shining on Poppy's back in the photo which gives out darker tones on her face and added in a little more detail in the fur than cannot be seen in the reference photo but I really do love this capture! 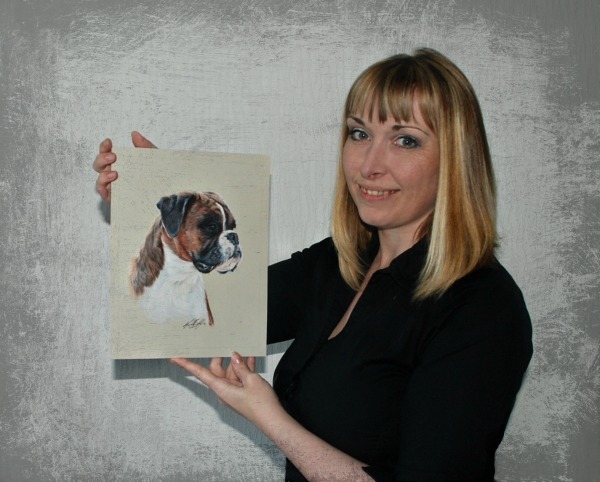 "An amazingly talented lady who brings your precious furbabies to life. Having lost our gorgeous Poppy very suddenly in June aged only 6 having her portrait done seemed a fitting tribute. Karen has managed to capture her soul and we are so happy to have our little girl home x"
Please click on the image if you wish to follow progress of this portrait.